"We" consist of four of us: Rich, Cherie, Timir and Komal. It all goes back to the mid 90's at San Jose State University.Rich, Cherie, and Timir were in the concert choir together, while studying at SJSU. As our friendships grew, there were many iterations. At one point, Rich and Timir were roomates. Things changed even more when Rich and Cherie started dating each other! Throw into the mix a bunch of our friends: Jeff, Nate, Damon, Scott, Erik, Holly, Mary, Chris, and a host of others, and it made for a fun few years! (Not that everyone was dating everyone else....but you get the idea). Fast forward a few years: Rich and Cherie are about to get married. 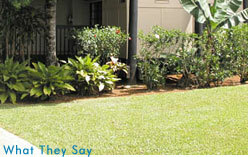 Rich and Cherie had been spending a lot of time on Kaua'i, because Cherie's brother, Steve was living on the island. One night, back in California, Rich, Cherie and Timir were having a nice dinner at their favorite Indian restaurant, and the idea was born! "Let's have a piece of paradise!". So we did it. 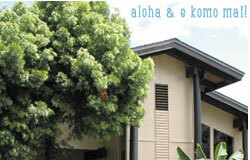 Mauna Kai #8 is our small piece of paradise! Rich and Cherie are now happily married, and living on the central California coast, living the good life. Timir recently married Komal and they are currently living in the SF bay area, and enjoying the life by the bay. Above is a photo of three of us (Komal not pictured) down on Anini beach. Aloha! !